The iPad mini, Apple’s newest device, is very much an iPad. It looks like one, it has the same long-lasting battery, and it runs iPad apps. But it’s also a device all its own. It’s lighter, smaller, and more portable. It’s better for reading. It’s less expensive. In short, it deserved its own book—which is why we’re proud to announce the 47th book in our Superguide series, Macworld’s iPad Mini Starter Guide. Whether you’re gifting an iPad mini this holiday season or awaiting its arrival on your own doorstep, the editors at Macworld are the perfect people to help you get to know your new device with our iPad Mini Starter Guide. It covers everything you need to know to get up and running with your new iPad. Totally new to iOS and not sure where to begin? Our Starter Guide will introduce you to the iPad mini and walk you through the activation process. You’ll discover basic gestures for navigating through apps and home screens, and learn some of our favorite tips and tricks. Maybe you’ve owned an iPad before, but want to freshen up on the device’s features and learn about new iPad mini additions. We’ll do that and walk you through Notification Center, Siri, and iCloud, Apple’s syncing service. We’ll also help you customize your settings to your liking, discover downloadable Apple apps like Find My Friends and Find My iPhone, and find out which third-party apps are worth your time. To get our iPad Mini Starter Guide right away on the device of your choice, you can purchase it now from the iBookstore and Kindle Store; our Nook Store version is coming soon. You can also pick up the book from our eBookstore. (And don't forget: Throughout the month of December, every book in our entire eBookstore is 10 percent off with the code MAC10.) We're selling our iPad Mini Starter Guide as a PDF for $3.99. Or for $4.99, you can purchase our ePub/MOBI/PDF bundle and have a version that you can read on your computer (PDF), iOS device or Nook (ePub), and Kindle (MOBI). We hope you have fun getting to know your new iPad mini. 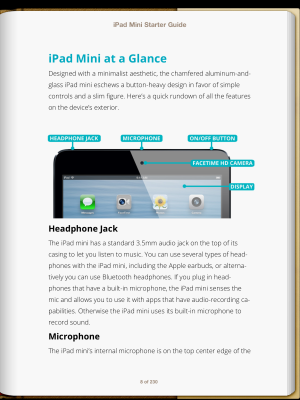 If you instead recently picked up an iPad with Retina display, check out the fourth edition of our iPad Starter Guide. For all your iPhone 5 questions, stay tuned for our iPhone 5 Superguide, coming soon. If you want to learn more about your other iOS devices, make sure to check out our available Superguides including our iPhone 5 Starter Guide, our iOS 6 Upgrade Guide, and Master iPhone Photography. Looking for Mac and OS X books? We also sell our Total Mountain Lion Superguide, Mac Basics, Mountain Lion, and Mac Gems, Mountain Lion edition.